A week ago I delivered my keynote presentation to an overflow ballroom at the Association of National Advertisers’ (ANA) Masters of Marketing conference in Orlando, Florida. My provocative title, Fire Your CMO: Marketing’s Future Will Not Resemble Its Past, was designed to drive tune in (check the box) and get marketers thinking hard (another check) by examining the Direct-to-Consumer (D2C) phenomenon that is sweeping marketing. Based on the crowd reaction and follow-up at the conference, press coverage and social activity, I seem to have struck a chord. What I didn’t expect was an interview by Marc Pritchard, P&G’s CMO and ANA Chairman with a point-by-point counter argument of my thesis. I like and respect Marc. He has been an excellent leader, not only at his own company but within the marketing community as Chairman of the ANA. Marc wasn’t in the room when I gave my talk which is unfortunate as he would have heard my broader message that marketers, who are challenged by growth, would be well-served to study the best practices of D2C brands that have managed to garner significant market share across a variety of product categories in a relatively short amount of time. I suggested that this phenomenon is more than just a passing fad and worthy of deep analysis, and action. Sure I made a stark observation about Gillette’s large market share loss to D2C brands, particularly Dollar Shave Club (acquired by Unilever for $1 billion in 2016) and Harry’s. Those are just observable facts. My broader point was that marketers need to dive in on the direct trend and adopt some of the applicable tactics for their own benefit as well as consider acquisitions in strategic categories. P&G has, in fact, done this. Besides their organic initiatives, I noted their acquisition of Native deodorant for $100 MM. 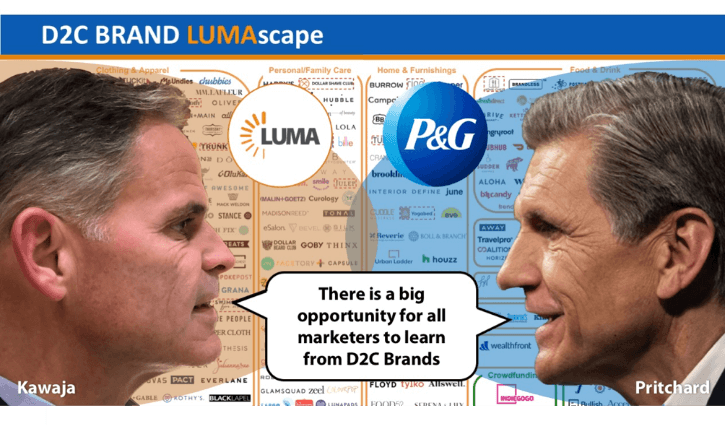 In fact, of all the traditional marketing companies, I would place P&G pretty far along the innovation curve, especially on the subject of D2C. From their excellent Signal industry conference to their venture arm that is focused on D2C brands, this is not a legacy player with their head in the sand. Furthermore, I know from working with P&G that they have a very sophisticated perspective on the application of leading marketing technology from customer identity solutions to multi-touch attribution to media buying strategies and content marketing – the very tactics utilized by D2C brands to win customers. I started my talk about growth by mentioning that I wasn’t going to talk about what preoccupies our trends presentations the last few years: challenging issues in the digital supply chain. Here, Marc has been a tireless advocate of the marketers’ perspective, especially in the critical areas of fraud, measurement, viewability and transparency. It was efforts led by Marc and other marketers that finally got the large tech platforms to relent and take action on many of these issues with their “power of the purse”, which I strongly commend. So, while I appreciate the attention that comes from having the CMO of the largest brand marketer in the world counter my ANA presentation, I think Marc would find that we are saying the same thing: that there’s a big opportunity for all marketers to learn from D2C brands and that those that ignore this trend may well earn the title of my talk after all.